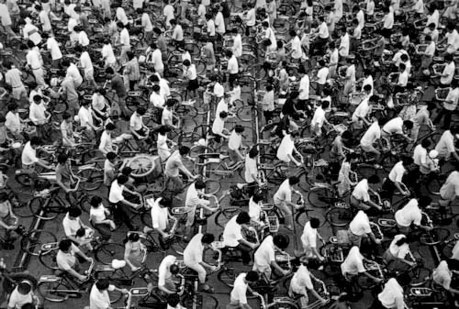 Back in March, I posted The Bike-Share Oversupply in China: Huge Piles of Abandoned and Broken Bicycles, showing just some of the millions of bicycles that had been rapidly built and dumped into Chinese cities by bike-share companies looking to get in on the next big thing, only to crash hard. In the months since, more of those bike-share startups have gone bankrupt or consolidated, and the bicycle graveyards remain. Municipal governments are still wrangling with the fallout, confiscating derelict or illegally parked bikes, crafting new laws, and working out what to do with millions of abandoned bicycles. In a few cases, plans have been announced to refurbish and distribute some of the bikes to smaller neighboring towns, in others, wholesale recycling has begun, and bicycles are being crushed into cubes. The scale of the situation was so large to begin with, it will be a long time before the bicycle graveyards fade away. Those are some incredible photos. Amazing the amount of waste. Send them to Africa. With crummy roads (where there any roads at all), villagers and dwellers in outlying areas have no workable transportation except Barefoot Express. A bike can save a life in that environment. Those photos are just stunning. You have to wonder how anyone could mis-allocate resources to that extent. There must be tens of millions of those unwanted bikes. One of those companies started littering Nashville with those yellow (ofo) bikes, this spring. They don’t have a rack or a central distribution point. You’re just supposed to use the app to unlock them, and then leave them wherever you are when you’re done. It’s an incredible litter and nuisance problem. I believe the city government forced them out of town. A Chinese company, Ofo, is doing about the same thing in Dallas. They brought in many thousands of bikes and have now started sending most of them to a recycling facility. Think of the co2 goin’ into the atmosphere when they made...pedaled on...and haul away those bicycles.where are the heads up their ### environmentalists? This reminds of the millions of exta E.T. game cartridges that they had to dig a hole and bury because they produced many millions more games than the number of Atari consoles owned by consumers. So that even if every one who owned a console bought one they’d still have millions left over. Thats a LOT of bikes! Meanwhile i would like to buy a bike, the guy down the street sells john kerry bikes for 5 grand plus..
Kernal of truth, but the story you recount has been exaggerated. The bike share program works great in Seattle. People need a bike they just jump on and ride down hill. Then they either walk or call a ride service to get back up the hill. Is that wrong? I have always heard about the burial and everything about E.T.. The documentary mentioned, ‘Atari: Game Over’ happens to be on youtube if your interested. I might check it out later after dinner.. So they were taking all of our recycled paper, because they have room for it? China’s an unimaginably vast place, like Russia, unlike the US. One of the Chinese companies just pulled out of Dallas when the city cracked down on the bike litter. Ofo dumped 5000 bikes at a metal recycler. The major competitor has pulled several thousand out of the market, as well. The competitor is apparently making money with an electric scooter business. Not that big a difference.